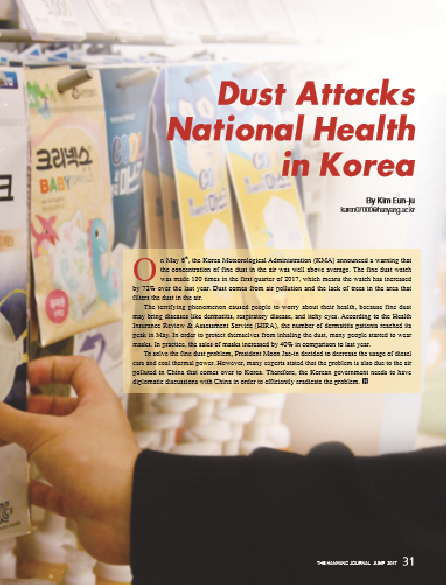 On May 6th, the Korea Meteorological Administration (KMA) announced a warning that the concentration of fine dust in the air was well above average. The fine dust watch was made 130 times in the first quarter of 2017, which means the watch has increased by 72% over the last year. Dust comes from air pollution and the lack of trees in the area that filters the dust in the air. The terrifying phenomenon caused people to worry about their health, because fine dust may bring diseases like dermatitis, respiratory disease, and itchy eyes. According to the Health Insurance Review & Assessment Service (HIRA), the number of dermatitis patients reached its peak in May. In order to protect themselves from inhaling the dust, many people started to wear masks. In practice, the sales of masks increased by 40% in comparison to last year. To solve the fine dust problem, President Moon Jae-in decided to decrease the usage of diesel cars and coal thermal power. 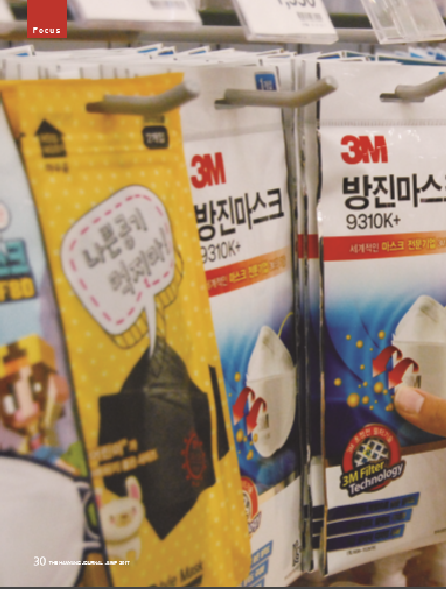 However, many experts stated that the problem is also due to the air polluted in China that comes over to Korea. Therefore, the Korean government needs to have diplomatic discussions with China in order to efficiently eradicate the problem.